Sunset Hill is the second stage of Sonic Advance 3. 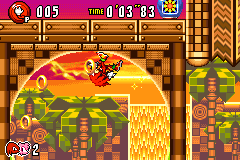 It is heavily based on the first level of Sonic 1, Green Hill Zone, but with a dusk-type setting, complete with palm trees and checkered soil. Even the palm trees are checkered! It also has Green Hill's music in remix form. Unique gimmicks here include water slides, tall segmented springs that recoil the player a short horizontal distance, bungee cords that catapult the player into the air, and vertical poles which the player can slide down and jump off of to either side using the button and the D-pad. There are also large, slow-moving floating platforms that can either assist you in navigating the stage or crush you, resulting in an instant death. Act 1 introduces water mechanics to Sonic Advance 3, albeit requiring Knuckles to access. Act 3 ends with a boss fight against Gemerl, repeating the same attack pattern as last time and going down in four hits (two on Easy). If this Act is completed with Sonic in the lead (although at this point, the only other possible combination would be Tails-Sonic), a cutscene will play. It will feature Sonic and Tails meeting Knuckles, who expresses his desire to support whatever are they doing, to what Sonic just says that they won't need any help by now. Knuckles, even angry at this, is unlocked for the main game and Time Attack modes. The music for this zone also incorporates elements of Central City's theme from Sonic Battle. Ape - A monkey robot similar to a Coconuts. Swings from trees and drops bombs. Gekogeko - A frog badnik that hops back and forth, sticking out its tongue if the player approaches it. Minimole - A mole badnik that hops out of holes in the ground. This page was last edited on 3 March 2018, at 19:09.